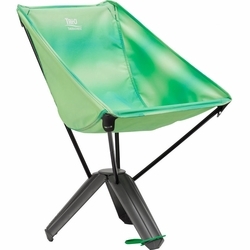 Therm-a-Rest Treo Chair. Updated with sturdy yet supple 300D Polyester Rip-Stop fabric, the patent-pending Treo camp chair is incredibly compact, comfortable and strong. It’s built with a realistic seat height and width that doesn’t require a technical plan of descent just to get into. And though it delivers the comfort and ease of use of a big chair, it packs entirely into its own tripod base, making the Treo Chair as easy to bring along, as it is to relax in.